The anime, unique because it doesnt have an ongoing plot but instead has a weekly mystery for the hero to solve, went on to win the Best Television Series and Best Art Direction awards at the Fifth Tokyo Anime Awards held in conjunction with the Tokyo International Anime Fair 2006. Its really a treat that this manga comes in a nice, matte cover showcasing the watercolour picture of Ginko, the one-eyed mushishi who solves mysteries caused by invisible, primitive lifeforms called mushi. Mushishi is refreshing; there are no magical girls here, nor are there mecha that wreak havoc on Japanese cities, nor is there a mission to save the Earth. 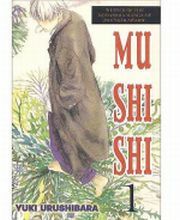 Instead, it focuses on Ginkos travels from village to village (its set a century or two ago in Japan) as he tries to find solutions to ailments caused by mushi. The mushi are so diverse and the symptoms so bizarre that they can be frightening (the mushi that causes a mans dreams to come true is one). The scares evoked in Mushishi do not belong to the Junji Ito house of thought (meaning: to gross you out as much as possible with gory sights like talking, rotting heads). Often, theyre real-life fears we hold. What is it like to go blind? What if a careless action causes the death of someone you love? Ginko approaches the mushi like an anthropology student. Although he acknowledges how dangerous they can be, he doesnt demonise them either. A quiet guy with a droll sense of humour, the man in the rumpled shirt holds many secrets which the manga slowly unravels for you. I must say that compared to the anime, the mangas art seems more rough and unrefined. Still, Urushibara uses shadings effectively to create an eerie feel of the world. There are interesting extras in the book  theres one where Urushibara relays a folk tale her grandparents told her. Now, if youve watched the anime, you will not find new stories in this volume as the anime follows the manga very faithfully. But I still say that this is a keeper because its a rare kind of manga that is unlike many out there. Plus, the stories are bewitching!